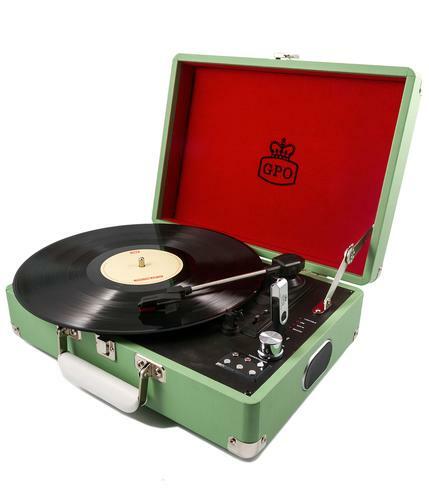 GPO Retro 'Jam' Union Jack 1960s Pop Art Record Player. Paying homage to Swinging Sixties design with a hint of Mod Revival culture thrown in for good measure! 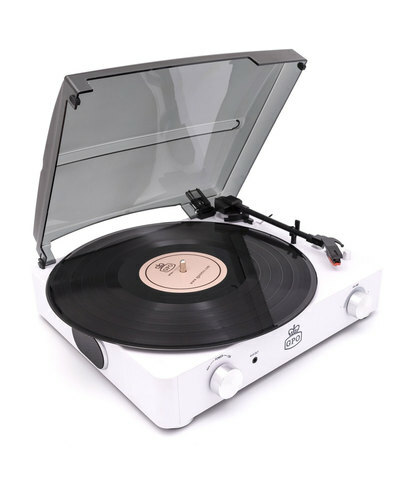 This stylish turntable style record player incorporates a Vintage design aesthetic that features a modern USB recording function for transferring your vinyl. With built in stereo speakers, clear dust cover and Retro chrome details, this portable Retro Jam Record Player is sure to be a hit... Reminds of the classic Jam track - That's Entertainment! A great gift idea that is sure to add a touch of 1960s Mod style to any home! GPO Retro Jam Union Jack 1960s Mod Record Player in white with cool chrome details and clear dust cover. 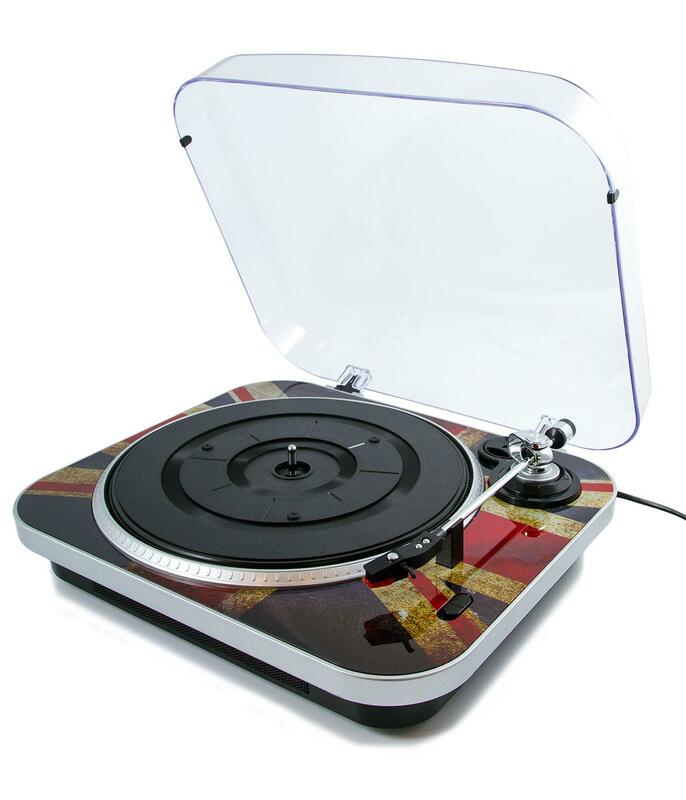 Vintage look Union Jack print resides on the platter, adding a cool background to teh traditional turntable. 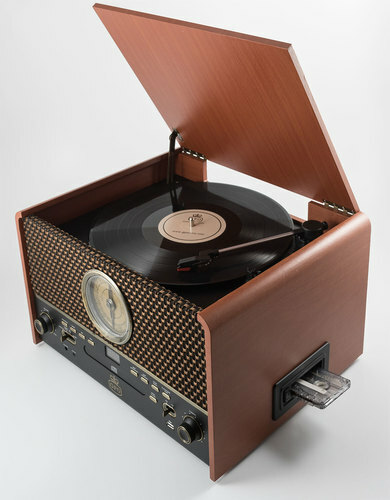 Record Player features built in speakers, saving the need for an external speaker system. There is an RCA output for connecting speakers if desired. Vintage look . Hinged dust cover, manual pick up arm and ceramic stylus. Plays all three record speeds, 33rpm, 45rpm and 78rpm. USB recording function meaning you can record from the player to a computer using the cables and software provided. 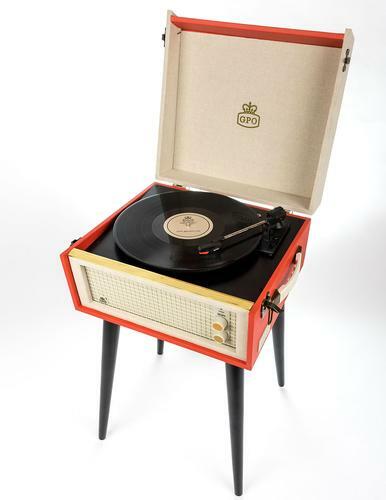 The GPO Retro 'Jam' Record Player boasts an incredible Sixties Mod design and will add a distinctive Retro look to any abode. The instructions and software disc are included in the box. Key Points: GPO Retro Jam Union Jack Record Player. Record directly to computer via USB, using software provided. Plays all three record speeds and features built in speakers. Clear dust cover. UK plug supplied only. Colour: White with Union Jack Print and Chrome finishes. 43.5cm x 42cm x 16.3cm - 2.8kg.